On this full-day tour, you'll be driven to the Oak Alley Plantation House, then see the Cajuns of the bayou living and surviving in harmony with the swamps. 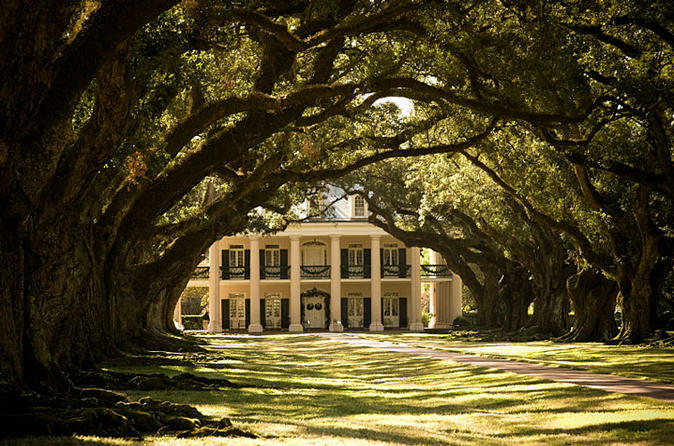 Located about an hour and a half outside the city of New Orleans, Oak Alley is one of the most magnificent plantation tours because of the 28, evenly spaced, huge Oak Trees that go from the river road to the Plantation House. Experience bayou living where here, the waterways are their highways. From the relaxed comfort of our covered New Orleans Swamp Tour Boats, you will drift slowly past a 2000 year old Indian Burial Mound, a Cajun cemetery and Fishing village! You may see the wildlife that made the Barataria Swamps the Crown Jewel of the Louisiana Purchase. Oak Alley Plantation Tour: The Greek revival home dates back to 1837. Located on the grounds, is a restaurant, blacksmith shop, souvenir shop and antique farm equipment. It is a comprehensive plantation experience. The tour of the Oak Alley’s house is conducted by guides in authentic plantation style apparel. Walking is required for this tour. Plantation house to the restaurant and souvenir shop is about one block in distance. There are benches along the path, shaded by the Oaks. Swamp and Wetlands Adventure: The New Orleans swamp tour boats are fully narrated and our captains are natives of the Barataria Swamps with a background of gator hunting, fishing and trapping. They will entertain you and amaze you with the ecology of the swampland. They have lived the life! Here, birds, snakes, turtles, fur animals, and gators are the kings of the swamp and easily spotted in spring, summer, and fall. Gators do hibernate during the cold winter months, but lay on the bayou banks on warmer days. So even in Winter, our native Captains can sometimes find a sunning Gator on our tour. The slow drift of our tour boats through moss draped trees and small waterways, will provide ample opportunity for viewing and photography. Your comfort is guaranteed on our tour boats. They have a roof, restroom, cushioned seats, and windows that can be raised or lowered during cold or rainy weather, along with plenty of standing and walking room. These tours are entertaining, educational and exciting.